​We are Doing Another Conference and You Are Invited! 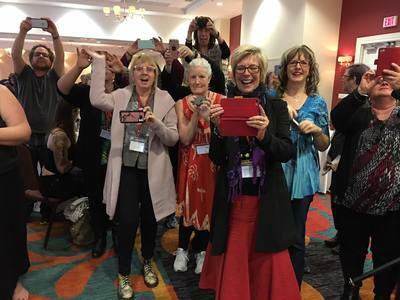 Hello, I am Marilyn Shannon of kingstonpsychic.com inviting you to our next big gathering of the Divination community in Kingston, Ontario, Canada, November 8 to 10, 2019. 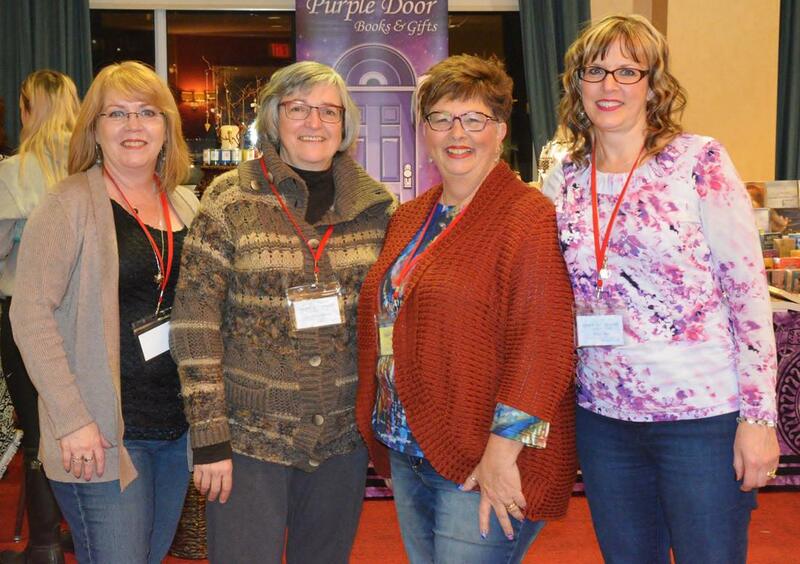 This conference is for full time diviners and those who dabble alike. The world needs all of us now, to be who we are offering what we can. As diviners we need education, community, support, and courage to offer what we do to the world beyond our doors everyday. We need to evolve with our tools, because our tools are constantly evolving. Tarot started as a card game, Mademoiselle Lenormand did not use the cards that we use today, and bones were cast and now we cast charms. In short divination, tarot, lenormand, and the techniques for past life regression and finding our soul's purpose have all changed in the last decade dramatically. I no longer work solely with just tarot cards. Do you? When we combine our divination tools we can offer seekers the best resources we have to help them find their way. Even if the seeker is our own soul. 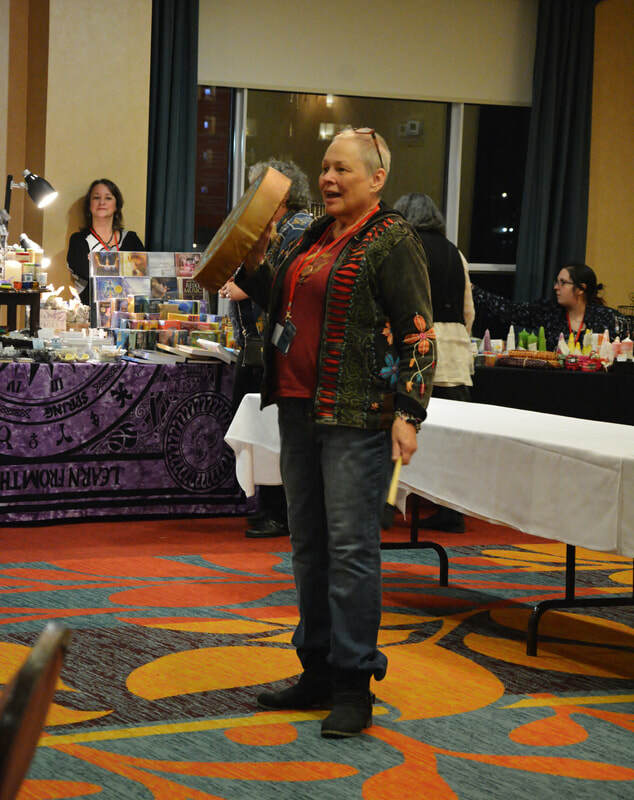 ​At this conference we will be using the ancient tools of charm casting, tarot, and Lenormand to call in our ancestors, visit past lives, and find our soul's purpose. This is the cutting edge stuff we need as we continue to answer the call of a world in pain. Which brings me to why we are having a conference like this. Besides learning, we need community and support. We need to spend time with other diviners to share, encourage, recharge, and restore our own beings. This conference offers a safe place to be your authentic intuitive divining self. You will be with your people. It is the best feeling ever. Andrew and Carrie have been traveling the world for the last 4 years sharing their unique approach to connecting with the ancestors. This workshop will help you build new skills to easily access your own ancestral conversations. For centuries diviners have reached for items from their casting bags to elicit communication with other realms. 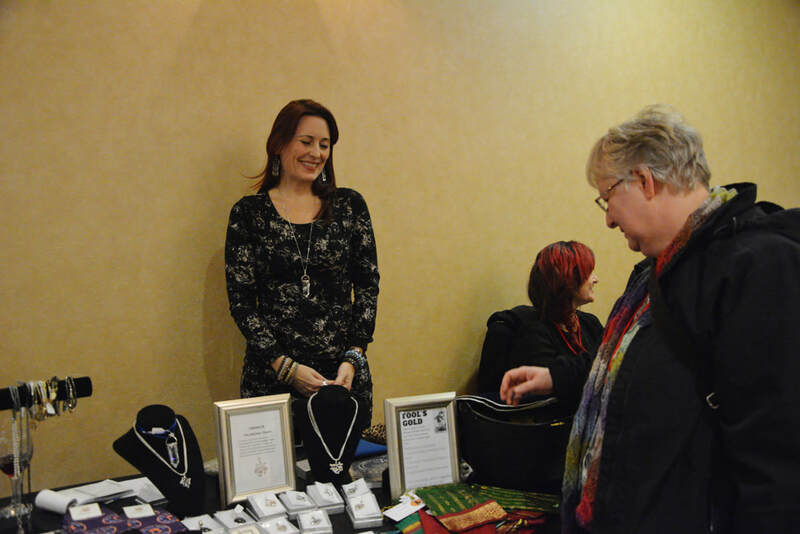 Carrie Paris introduced us to charms and Lenormand in 2017. We all wanted to learn more. Saturday morning Carrie and Andrew will give us more. Included with your registration is a very special gift. You will receive a special collection of charms curated for this event, casting cloth and other tools you need to charm the dead. Anne has this to say about our casting workshop in 2017: I went to both conferences. It was wonderful meeting new people & learning new ideas on how to read tarot. Our speakers in both conferences brought their own way of reading cards. A new way of reading, for me, was brought in the last conference. It was casting. A totally fun way of reading. Going to the conference was a fun learning experience for me. 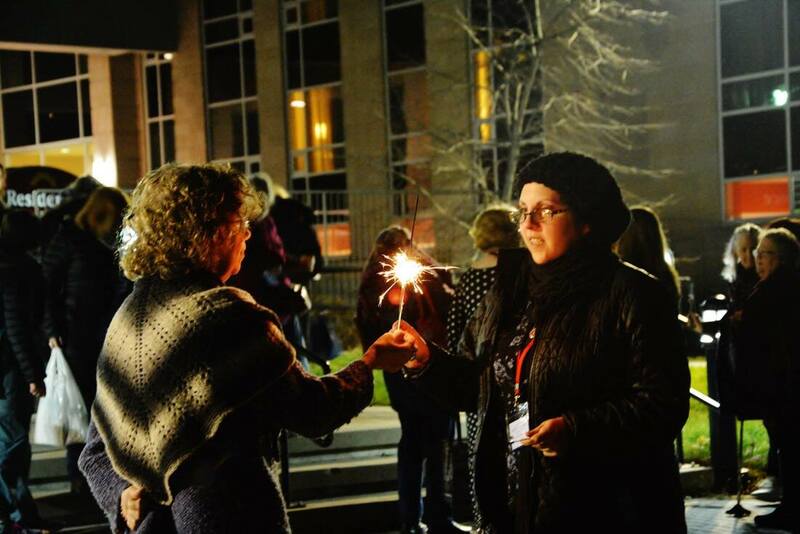 ​Carrie Paris was in the first class to receive a Masters in the Cultural Study of Cosmology and Divination from the University of Kent, UK and describes her education as Hogwarts for adults. She enjoys keeping an eye on futuristic trends and in doing so has beta-created MyBirthCards.com with Gabe Marihugh. 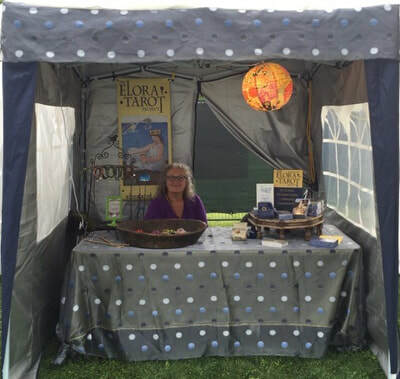 Carrie has authored the Magpie Oracle casting kits, the Relative Tarot, the Legendary Lenormand and co-created the award winning Lenormand Revolution deck. She has also taught and co-created three casting kits with Andrew McGregor that explore communicating with the ancestors and Other-Side. 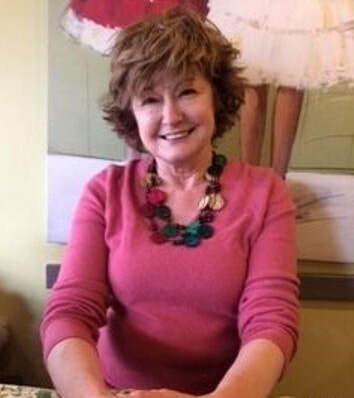 ​Carrie considers herself a global citizen and enjoys teaching her craft in many countries while dividing her life in California and Europe where she can be found reading cards along the Mediterranean landscape of her ancestors. Find her at, CarrieParis.com. Andrew is a reader, artist, medium and spirit worker. He runs his shop The Hermit’s Lamp in Toronto and has worked around the world teaching and reading for people. He has published several decks and books. His podcast, The Hermit’s Lamp Podcast, has been acclaimed for it’s profound and moving conversations about living a spiritual life. Visit thehermitslamp.com to find out more about the shop and Andrew's recently released The Orisha Tarot. Carrie and Andrew's workshop will be Saturday morning. They will also be available Sunday afternoon in our "Work With Me" session. Explore a past life in a tarot spread specifically designed to take you back in time to see who you were and where you came from. Knowing this will help you resolve past life challenges and help you move forward with this life unblocked by unacknowledged and unrecognized baggage. You will need a tarot and/or Lenormand deck, we will explore the spread using tarot and Lenormand individually as well as both together. We will each be creating a collage in honour of the life we discover in our past life spread. By creating a memorial piece to your past self you will be making art that honours and integrates a forgotten portion of your past into your current life. Some collage supplies will be provided. You are encouraged to bring extra bits and pieces of magazines or photos you might wish to use. Details on what to bring will be available on the Facebook group page and in a newsletter later on. Monica will be leading our Past Life journey Saturday afternoon. You will be able to work with Monica again Sunday afternoon in our "Work With Me" session. 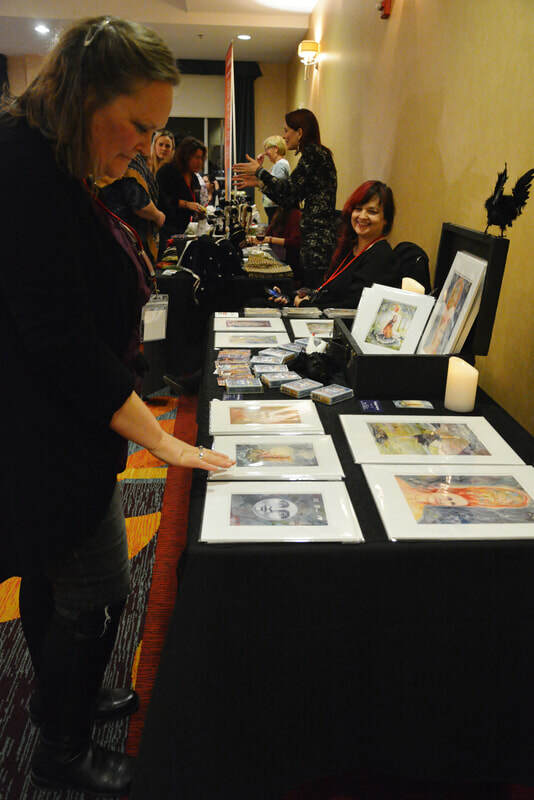 Monica Bodirsky is an artist, author, educator and witch who has been reading cards for over forty years. 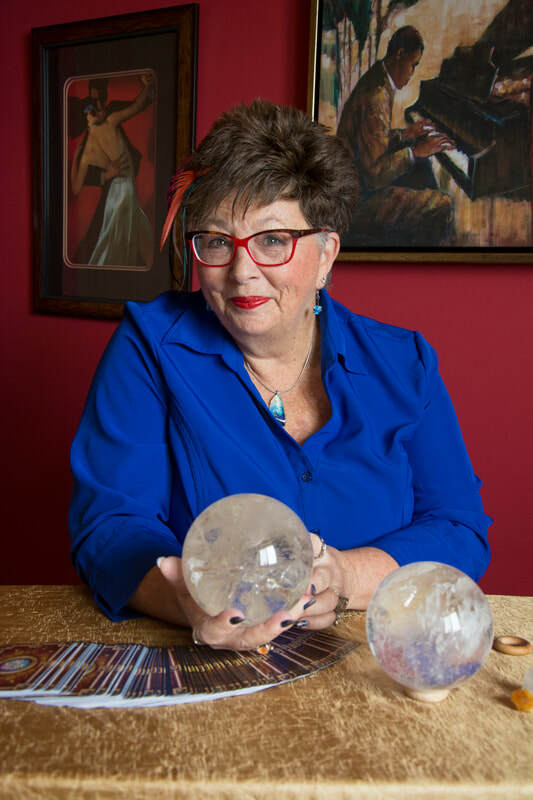 She is the founder and Program director of the WITCHfest North Festival and author of the Lucky Lenormand and House of Shadows Lenormand Oracle. I love it when we get to work with artists and let our 'inner artist' loose! How about you? Your Life Purpose in the Tarot. You feel a magnetic pull from within to live a meaningful existence and intuitively know that these times of uncertainty require your unique gifts. You sense there is more, but sometimes ask yourself if you even have a purpose. You do! Although your desire to catch and implement a larger vision of who you can be makes you feel like an outsider at times, you aren’t alone. Like a tarot deck that's missing a card, a universe without you would be incomplete. You possess qualities and skills that are needed right now and in the months and years to come. 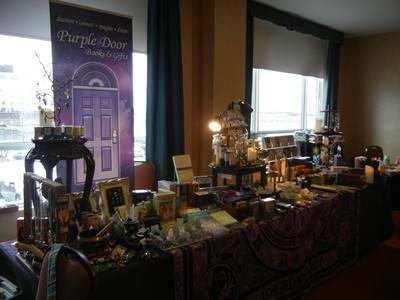 It was over ten years ago now, that James came to Kingston for the very first Tarot event I organized here. There were six people at that event. My how the divination community has grown. Glad to have you leading this workshop James. Welcome back to Kingston. James will lead our soul journey work on Sunday morning and will be available for our Sunday afternoon "Work With Me" Sessions. How do I register? How much is all this anyway? This is a big luscious weekend. 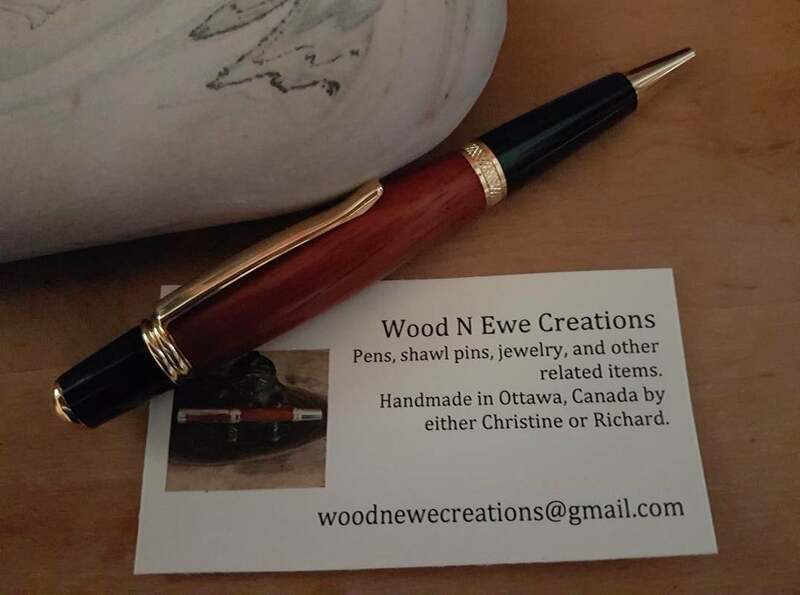 We have sharpened the pencil and offer it all for $397 (plus 13% HST) Canadian funds and Canadian tax! Make a single payment of $448.61 (includes 13% HST) by PayPal or credit card today! Thank you! Here is the PayPal button. ​​Installment plans make it oh so easy to join us. The number of installment payments and the amount of the payment will change on the first of each month. A word about refunds: If you cancel by September 30, 2019 we will refund all your money less a $50 handling fee. If you cancel October 1st, 2019 or later there is no refund. Make 6 payments of $74.77 (includes 13% HST) starting today! Canadian funds. Use the button below to pay via PayPal with installments. Thank you! ​ If you don't do PayPal or need a special payment plan email Marilyn Shannon at kingstondivinationtlc@gmail.com and we will create something that works for you. Or call or text Marilyn at 613-328-6128. ​And a reminder of our Refund Policy: If you cancel by September 30, 2019 we will refund all your money less a $50 handling fee. If you cancel October 1st, 2019 or later there is no refund. Thank you. It is Sunday afternoon. Your head feels like a football about to explode with all that information. You cannot pack another bit of new information into your head. And yet, you really wish that you could ask the presenters one more thing. Or maybe you would like to work through that exercise in a little more detail. Well, this year you can. Sunday afternoon we have allotted 2 hours so that you can spend more time with all four speakers to ask questions, work with a partner or two and really solidify what you have heard over the weekend. I can tell you that the speakers are really excited about these sessions too. All four of our speakers are great teachers. They want to make sure that you 'get it'. Since our last conference we have continued learning and supporting each other in at least two ways. We have a vibrant Facebook page for people attending the conference so that we can maintain our connections easily. We also have classes via Zoom that are interesting and fun. These are just two of the added perks for attending the conference. And laughter! Don't forget the fun that continues for all of us. Where is this Conference Anyway? 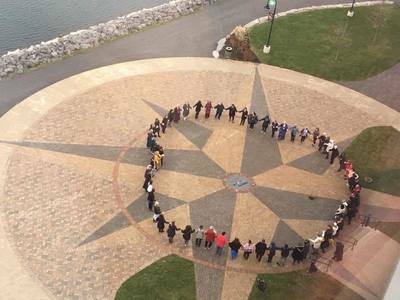 ​The conference is held at the Residence Inn by Marriott Water's Edge, 7 Earl St., Kingston, Ontario, Canada, November 8 to 10, 2019. It is a beautiful hotel on the shores of Lake Ontario where you can see the sunrise every morning. Our special room rate is $174.00 per night. Each room has its own kitchen. Two people can share a room very comfortably. Find your roomie! There is also a salt water indoor pool. A full hot breakfast is served to hotel guests every morning. Here is the link to make your hotel room reservation. If there is any problem at all let me know right away. We can fix any problem within 24 hours it seems. ​When should I come to Kingston? ​Official conference events don't kick off until 4 pm on Friday November 8, 2019. But.....we will be offering the very popular Kingston Food Tour on Friday afternoon at 3 pm. And Readings! Some of our speakers and vendors will be offering private reading sessions from Thursday evening through the weekend. We will let you know who is offering sessions and how to sign up for one next fall! Short answer: Come to Kingston Thursday if you can and if you want to take in these extra events and see the city. 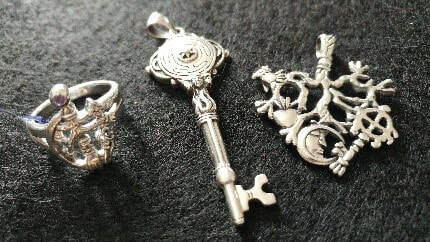 It is charming. Here is what Sandra has to say: I attended the 2017 conference. My friend Judie asked me to tag along and am I ever glad I did. I had a marvelous time at the various presentations, the experientials, learned new approaches, met the most amazing people, made new friends, and cannot wait for the next one to occur so we can all be together again. Oh, the food was awesome and plentiful, the milieu great, and my spirit felt like it was wrapped in the most comfortable blanket that was not too hot, not too cold, just right! 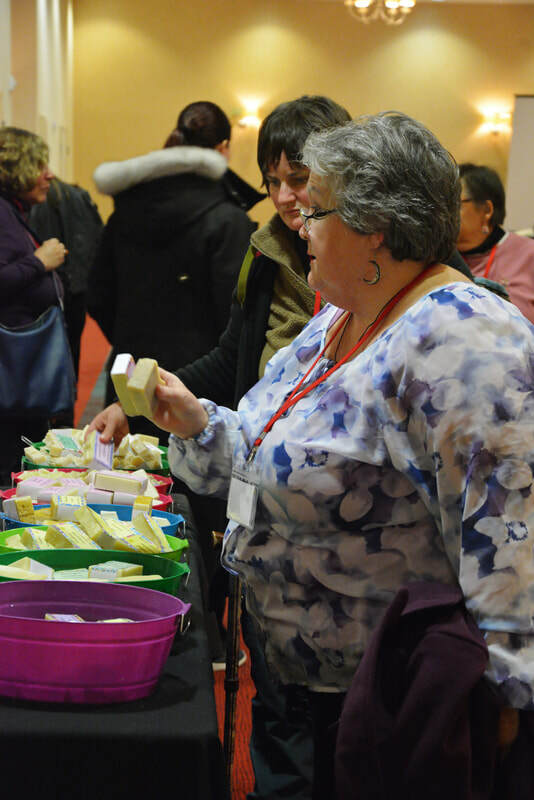 I am so looking forward to the next conference and to lots of shopping because the crafts and products were both outstanding and original. Marilyn Shannon and her team do an outstanding conference. Friday night is when we get to chat with each other face to face! And give and get hugs. You can't do that online. 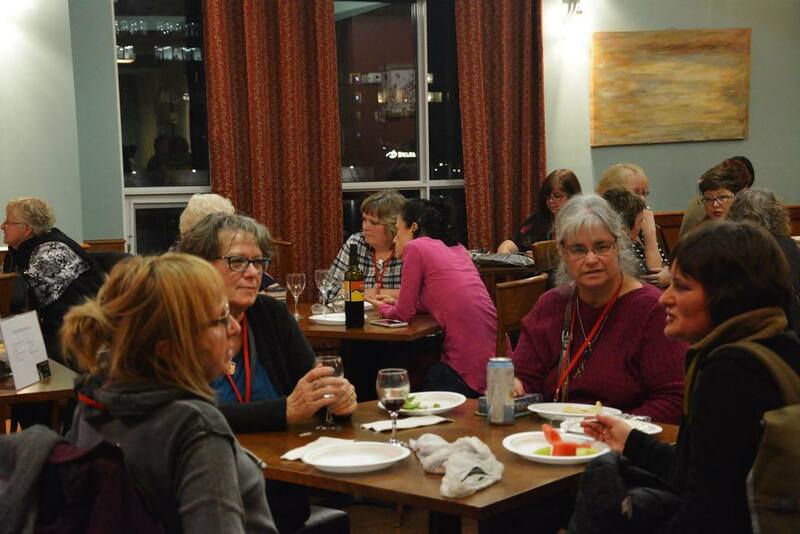 The laughter and connections on Friday night make the conference that special event that you do not want to miss. ​Ritual tells us that we are gathering for something important and life changing. Shelley and Gail have joined forces to bring us together in ceremony to open (and close) this meeting of diviners. Shelley asking us to touch each others hearts and Gail taking us to the depths of the Lake as Mermaids at the last conference still moves me. Imagine the two of them working together? Gives me goose bumps just thinking about it. You? ​ Lorita found this to be true: I feel so blessed to have been able to attend the Kingston Tarot Lenormand Conference in 2017. 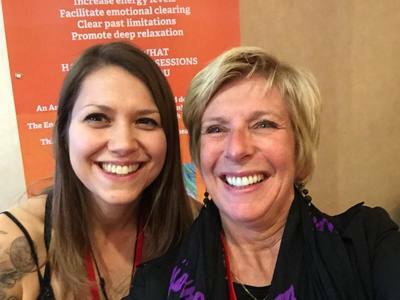 Not only was it a priceless opportunity to learn more about Tarot from incredible teachers, I strengthened friendships and made connections with so many beautiful people. Marilyn Shannon is an extraordinarily gifted facilitator who, along with her team, left no detail unattended and made everyone feel very much at home. 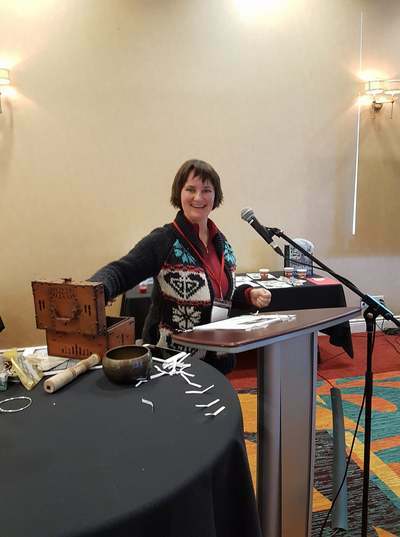 Lynda Fox:The past two Kingston Tarot Lenormand Conferences provided us with world class speakers, tops in their fields. 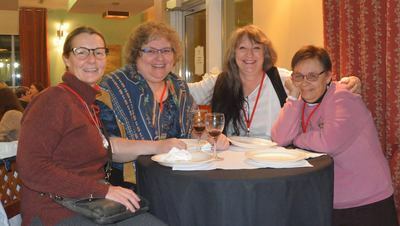 But, just as important, they have helped create a Canadian based international tarot community, not just of readers, but of friends who continue to share their talents and friendship long after the conferences have ended. 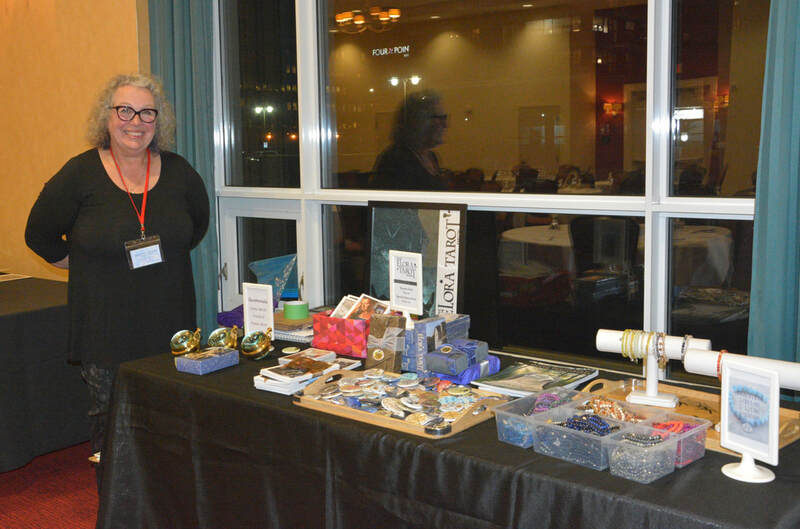 ​And from Susan Lynx: The 2017 Kingston Tarot Lenormand Conference was a blast! Great venue, outstanding teachers, meeting new friends, moving ritual. I can hardly wait to get back for 2019. ​Debbie Thompson: I attended both conferences I cant really pin point just one moment that stands out for me because both events were full of excitement, joy, learning, laughing, community and friendships that will last forever. 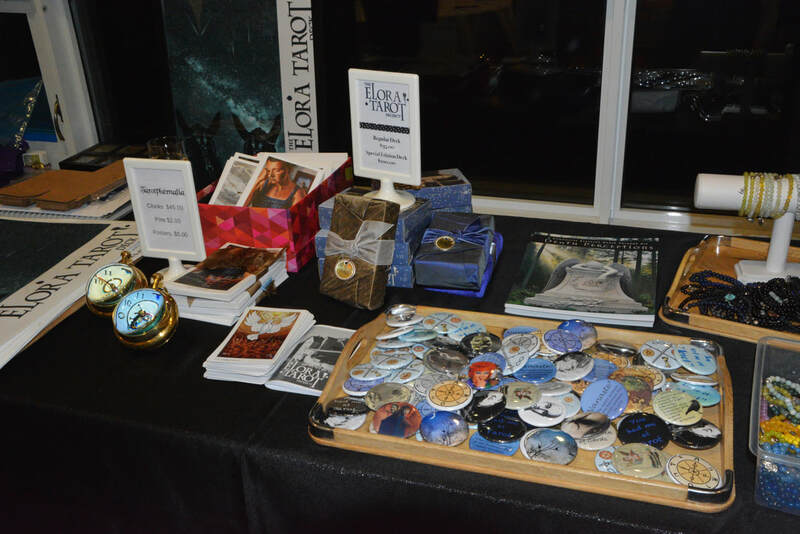 Yes I agree with Lynda Fox because of Marilyn Shannon and the conference team we now have an established Canadian base International Tarot Community which was long overdue, how could this NOT BE AMAZING!!!! We promise, we will look after you very well and that includes feeding you. You work hard. This weekend let the fine folks at the Marriott and Tulips and Maple look after you. Saturday and Sunday full hot lunches (yes people put weight on last conference as it was all so good)! If you have special requests, we will do our best to look after you. All day coffee and tea. Water on the table at all times. Saturday Supper...you might want to get a group together and make a reservation to go out in small groups; some people order pizza in as they are just too overwhelmed to go out. Note: There is no restaurant in the hotel but there are many excellent restaurants nearby. Friday: We will be organizing the Kingston Food Tour Friday Afternoon at 3 pm. You will have to register and pay for this in advance and it is not included in your registration. Oh they had fun in 2017! We have been asked to do this again so we will. Details later. Ready? Sign Up Right Here. This is a big luscious weekend. We have sharpened the pencil and offer it all for $397 plus 13% HST Canadian funds and Canadian tax! Make a single payment of $448.61 (includes 13% HST) today! Use the button below to pay via PayPal or with a credit card. Thank you! ​Installment plans to make it oh so easy to join us. Make 6 payments of $74.77 (includes 13% HST) starting today! ​If you don't do PayPal or need a special payment plan email Marilyn Shannon at kingstondivinationtlc@gmail.com and we will create something that works for you. Or call or text Marilyn at 613-328-6128. Shopping Anyone? Bring Your Piggy Bank! Shopping commences Friday evening with a sneak peek (don't be fooled this is full out shopping) and continues all weekend long right in the ball room where the workshops are being held. Your favourite vendors will be returning with new and exciting goodies just for you. Let me introduce them all to you now. We are so happy that Linda Scallion owner of Purple Door Books and Gifts and our main sponsor is returning with all her treasures this year. 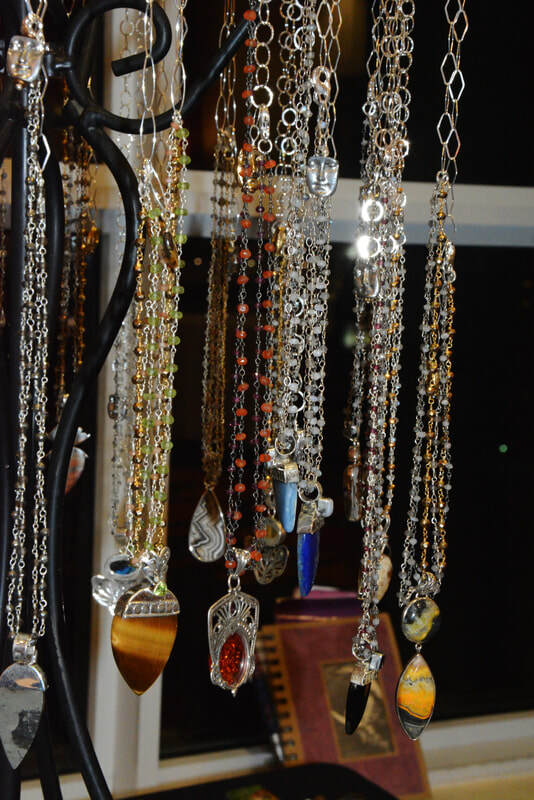 Linda always knows what we want and makes sure to have so many tempting decks, books, jewels, crystal balls and well...you know! The things we need to do our craft. 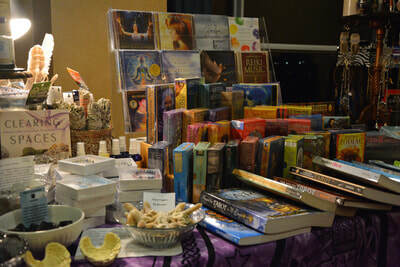 Let Linda know if there is a book or a deck that you would like her to bring to the conference especially for you. Welcome back Linda. And thank you for all you do. 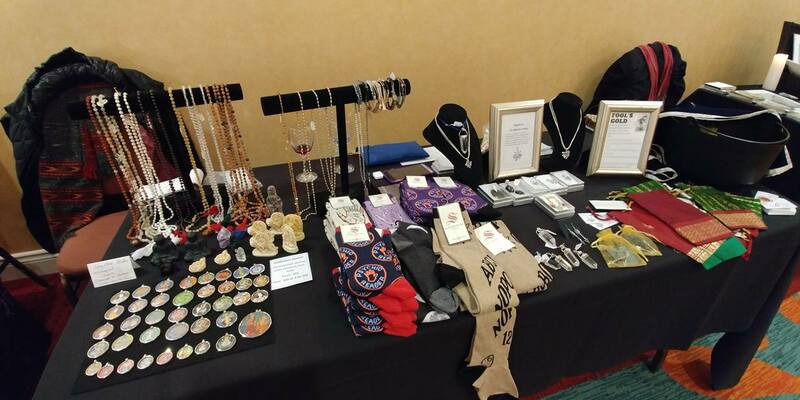 ​PrettyRox jewelry is hand made with semi-precious gemstones and crystals that are infused with the healing energy of Reiki. 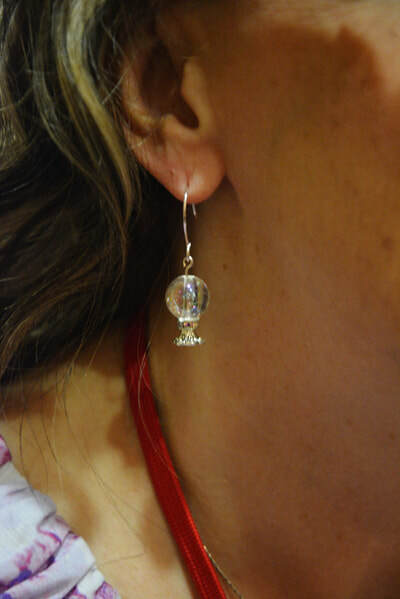 Crystal ball earrings, pendants and charms are available in a wide variety of colours and stones, including Quartz, Citrine, Amethyst, and agates, to name a few. New this season are lava stone earrings and bracelets that can be scented with your favourite essential oils for an all-day aromatherapy experience. 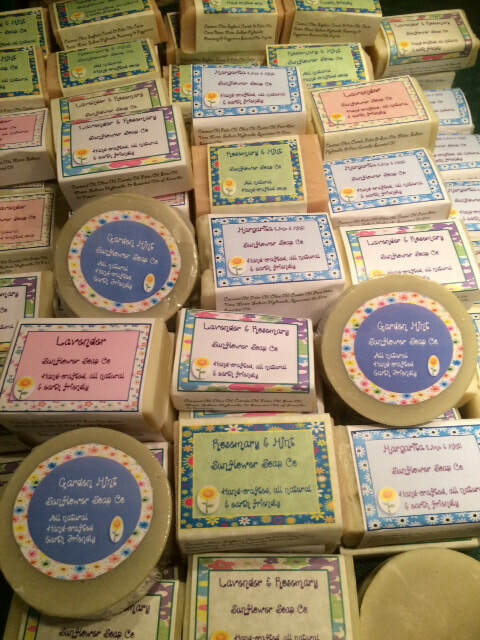 Moonflower Soaps are created in small batches the old-fashioned way, using skin-nourishing oils, butters, herbs, botanicals, and 100% pure essential oils. The result is a wonderfully creamy, bubbly lather that is rich in natural glycerine and gentle enough to use on your face. Kate’s TouchStones Anecdotal Art (Each piece tells a story; perhaps it touches your story.) 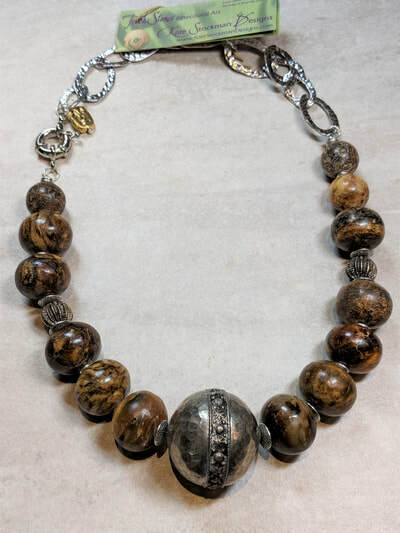 assemblage jewelry incorporates sterling, semi-precious stones, handmade lampwork glass beads, sacred imagery, and bits and pieces of Nature in one-of-a-kind designs. 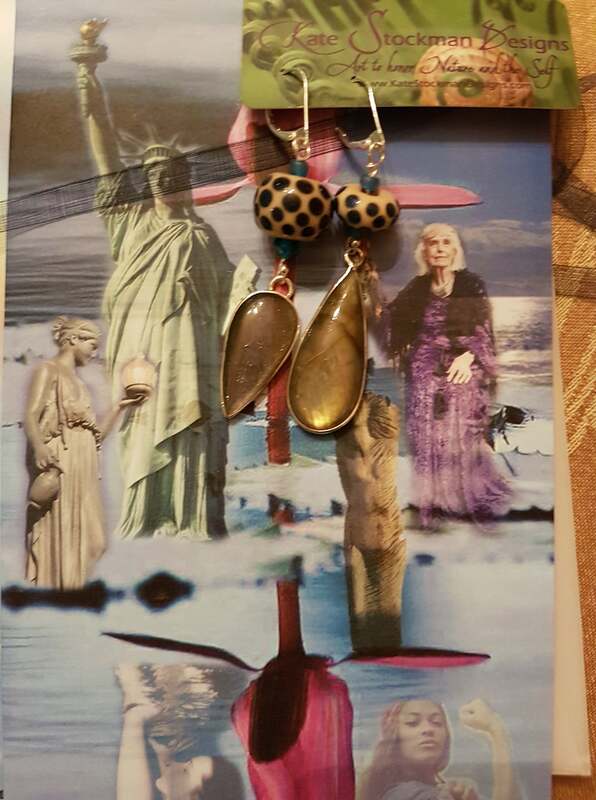 Each necklace comes with a story card. Her “Happy Mirthday” Greeting Cards include original digital collages printed on 5 x 7 notecards (blank inside for your message). The reverse has a playful “I Spy” invitation with a list of all the images in the collages. The cards are paired with vellum envelopes. Sets include “She Rises” and “The Wheel of the Year”. You can learn more about Kate’s art on her website www.KateStockmanDesigns.com as well as on Facebook. 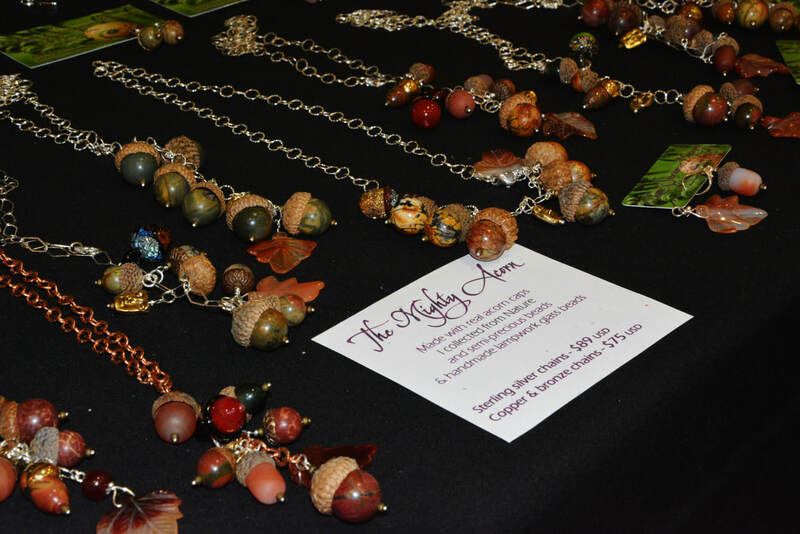 Shelley Carter brings those interesting little treasures from all over that intrigue us and tempt us. I finally have my Hermit clock which delights me every day. We are grateful that Shelley has taken the helm of Ceremony at this conference. Thank you Shelley. If you would like a reading, catch up with Shelley to arrange one over the weekend. 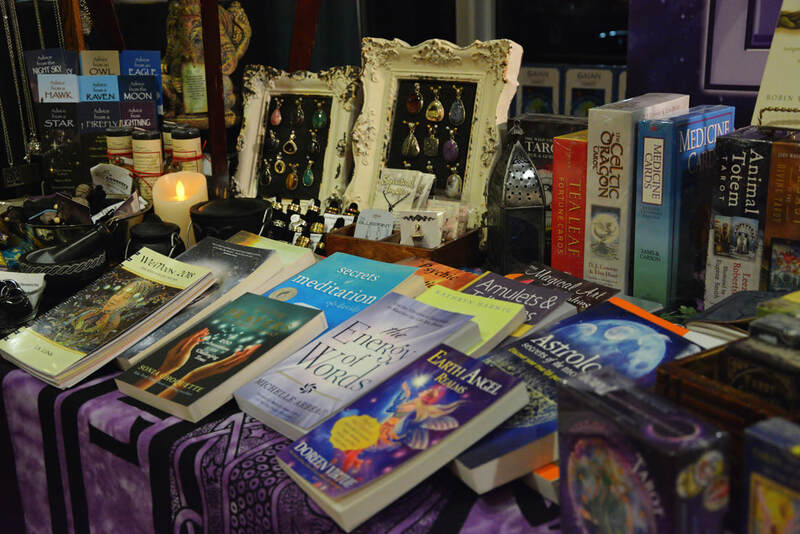 Shelley convenes the Elora Tarot and Divination festival in May. If you do not have an copy of the Elora Tarot it really is a great reading deck and just a little funky and interesting for those clients who want something different. 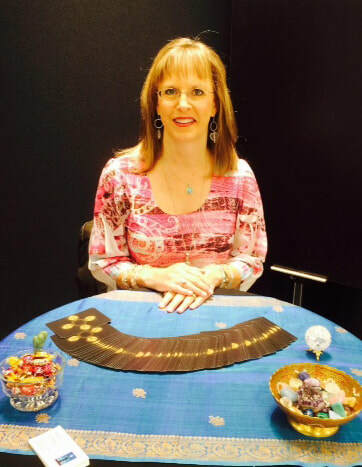 Get some mystical yet practical guidance with Lori Lytle and her Tarot cards. Lori will be offering a limited number of private Tarot readings on Thurs Nov 7 and Fri Nov 8, email her at info@innergoddesstarot.com to book your spot. Lori is known for her empowering and compassionate style, come and see her for direction and inspiration! Lori and her sister, Angela Lytle, will also be back with their magical gemstone talismans, protective amulets and Goddess jewelry. 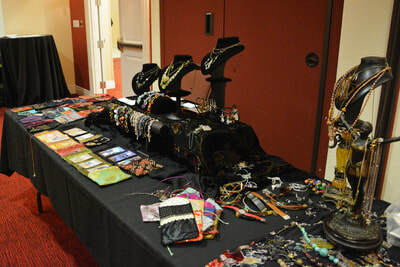 Last time their cimarutas (witch charms) sold out in record time, be sure to visit their vendor table when you arrive! 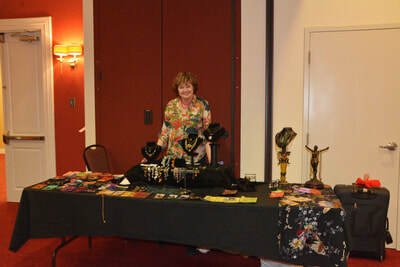 Susan Brecht of Aloha Healing will be offering her Ha Breath infused jewelry. Many of you have commented how powerful this jewelry is when you wear it. We are very grateful that Susan will once again use her healing Ha Breath just before lunch on Saturday and Sunday. Susan generously sends us all energy. At the last conference she noticed that many people were coughing. She concentrated on our throats and coughs and was pleased that the coughing stopped in the afternoon. Judy Nathan sews up the most beautiful bags for our tarot and Lenormand decks. There is always a story of where the button came from or how extravagant the material is. 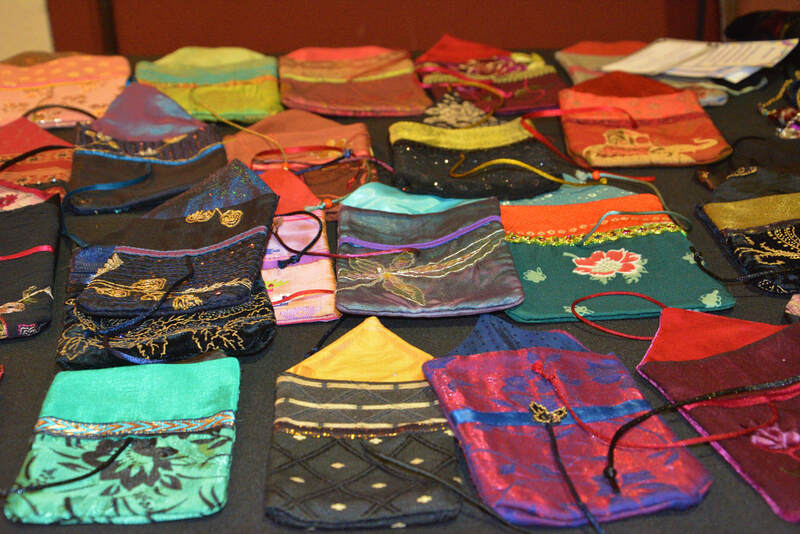 Using these bags for your deck is like clothing them in fine jewels and gold threads. And why not! 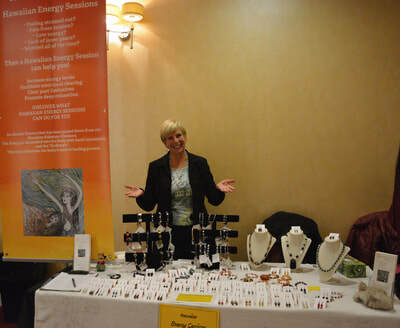 And Judy offers Goddess guided bracelets and jewelry. No piece is the same as the other. Unique, creative and Goddess wisdom! Beware, the Goddess seems to cast her spell and draw you in. 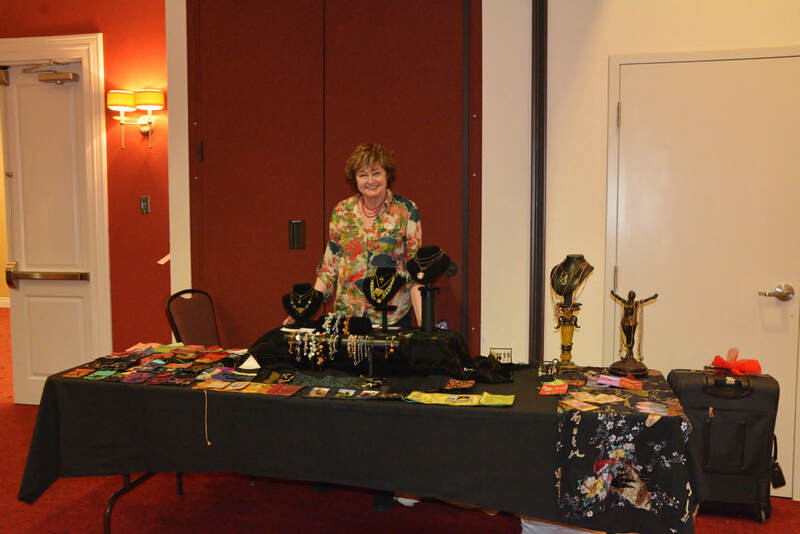 Treasures and lovely pieces await you at Judy's table. Monica Bodirsky creates beautiful and funky decks. Her House of Shadows Lenormand deck makes me chuckle and yet gives a full and rich reading. The Rider card in our masthead is from this deck. Monica is the creator of Witchfest North which runs for the whole month of October in Toronto. I wonder what unique treasures Monica will have with us this year? We know that both these artists have beautiful decks that we anxiously await. Carrie's new expanded Relative Tarot deck is causing quite a stir. Andrew's The Orisha Tarot is another hot deck. Carrie's Sirens' Song Lenormand Fish Card is in the masthead illustration as is Andrew McGregor's Ace of Wands from The Orisha Tarot. Our merchants are very generous. Our door prize table was overflowing with marvelous goodies in 2017. We appreciate the many donations from our vendors and people attending. Vanessa is in charge of pulling your name for a prize. We meet once a month for over a year to plan the conference. We try out all the great restaurants in Kingston. It is a tough job but we do it willingly for you. 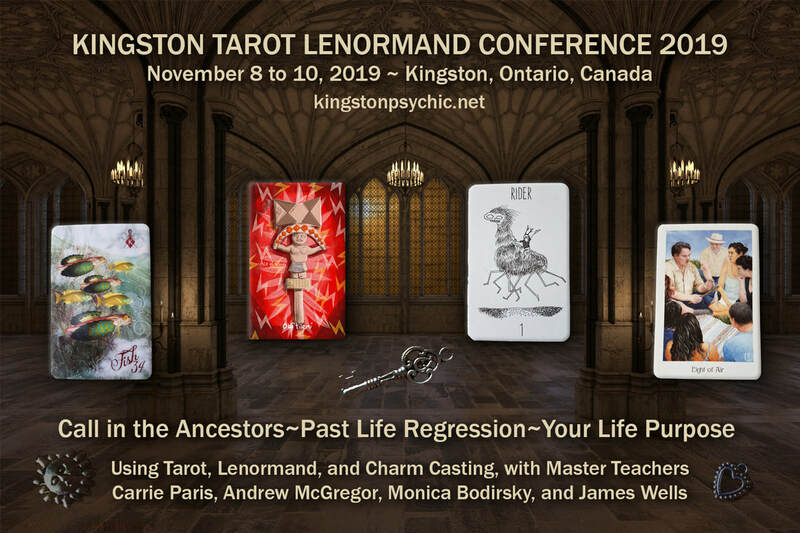 Kelly Chapman, Maria Cordeiro, Marilyn Shannon and Mary Alps and all the other hardworking volunteers welcome you to the Kingston Tarot Lenormand Conference 2019.